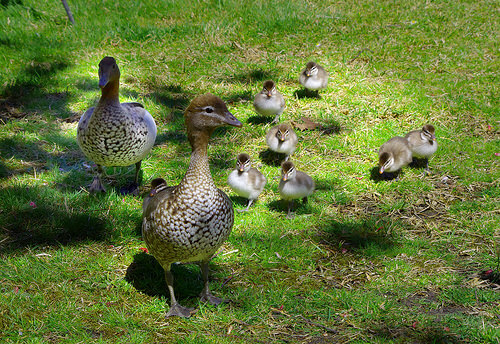 First days in the family (Australian Wood ducks). The rain eased at noon in Bellbowrie, Queensland today, but only for a few minutes. It has been storming for two days. The rain’s destruction was evident in washed garden beds and the main road overflows. I found some of my cuttings and seedlings floating in odd places, near the main road. Yesterday, at the Coles Supermarket we were unable to purchase staple food like bread and rice. A Cole’s staff member said residents had a panic buy, stocking up in case it flooded like the 2011 Queensland floods. The supermarket was empty. Several places outside our house were flooded. I had kept indoors and started a new artwork and read blogs. Only two days of wet weather and storms – yet there was too much water. On the news Brisbane was supposed to have 500mm of rain over the weekend. More rain will come. In the distant, I heard a familiar cry that tugged at my heartstrings. I left the watercolour and went outside to the balcony. “Listen!” I told my son Nathan. We both waited and the cry was muffled by the sound of rain on our iron rooftop. It came again and I knew the cry was coming from the open field and then it moved around the back, near the duck’s nesting ground. She did come back. Her cries were strange, long and despondent. I knew. “It’s her, something has happened”, I said. I put my raincoat on and walked through the drizzle in the soft mushy flooded ground to her. The male duck, her partner was by her side, quiet. They made a striking couple. Her brown and white spotty breast and belly topped with deep brown-black wings, and he with a touch of spotty chest, blue-grey and black flumes. They stood on the fuzzy open plain of short stubby blue couch, Queensland’s native grass. The rain water was caught in the grass blades giving it a wet, fuzzy sheen. I looked around the two ducks. The seven ducklings were nowhere to be seen. My heart sank. The inevitable had happened. The mother’s face was turned towards the pool, where she had hatched them. Her neck stretched forward and long in a breaking curve. Her mouth was wide opened, showing her pink insides as she wailed. Her cries were louder as I got closer. My eyes warmed into tears. She looked at me and stopped crying. I stopped a few meters away. I wished I had some duck-words to comfort her. I could only offer her some food and walked away. How very sad. 😦 Mother nature can be cruel. Thank you and yes – cruel. Queer, comical, and strange birds, ducks are. I like them. I spent much of my life around wild Mallards and domestic whites. A lot of people think rain is romantic, and so it is. But it also can be destructive and a nuisance — not to mention just plain wet. True Michael. I like the wild Mallards too. We get a pair that visit daily. Hi sista, tru ya. Turangu, tenk yu long kam lukim mi. As a child living near a stream that flooded each spring, we often rescued and raised orphaned wild mallard ducklings. They got to swim in our bathtub (God bless your tolerant ways, my nature-loving mother) and would follow us around in single file, peeping their way into our hearts… Perhaps some kind soul has found one or two of your missing brood? Thank you very much for sharing Maria. Let’s hope some of them were saved. I really wish that humans would realise and understand that animals other than themselves have feelings and can feel happiness, contentment and sadness just like we do. How many elephants, and other animals need to be shown crying and laughing before the message gets across. Sorry you couldn’t help the ducks Joycelin, but nature took it’s course before you could help. Thank you very much Chris. We (humans) have a long way to go.